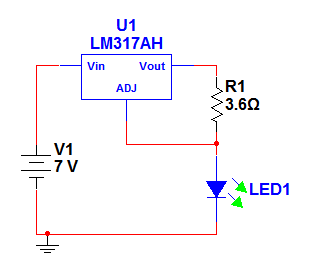 In the previous post we saw a simple LED driver based on integrated LM317, but as explained one of the faults of the circuit is the high dropout. 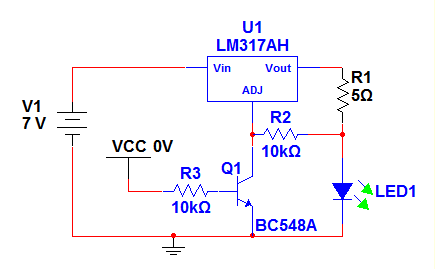 Thus we see today a scheme based on a single transistor (in our case a BC337, but any NPN is fine as long as we know all the electronics characteristics), which has a dropout of about 1.25V. Of course, you can also use just one LED. I put three in series as example, as we are able to drive three 1W LEDs with a high efficiency. 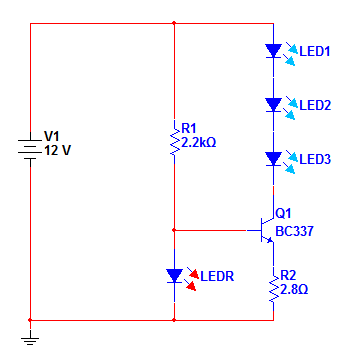 In the abovbe figure, we have a LED power of about 3W, while the whole circuit consumes about 4W. The LEDR is a standard LED and serves as a reference voltage for the transistor. The red LED dropout is about 1.8V, then the collector of the transistor will receive approximately 950mV. Always applying Ohm’s law 0.950 / 2,8 = 339, then with R2 at 2.8Ω there is a current leakage of 339mA, which will flow also through the emitter of Q1. In this way we will have a constant current regardless of the input voltage. This is true as long as the voltage will be sufficient to maintain the LEDR at 1.8 V, or 1.2V on the emitter of Q1. So in other words we expect that the input voltage is at least 1.2V higher than the dropout of the LED that we are going to drive. White leds for example, have a maximum voltage of 3.6V, so 3.6 × 3 = 10.8V and 10.8 + 1.2 = 12V. In this case we are perfect. I always recommend a voltage of about 1.5 V more for safety. If the load to drive is greater than 500-600mA, it is possible to decrease the value of R1 up to 470Ω. If we want to exceed 750mA instead, we should replace the transistor with a darlington type like the BD677A that can deliver up to 4A! You can test the circuit by changing the values, using the free simulator online at this link. In this case we have to slightly decrease the value of resistance R2, due to the fact that the Q1 driving voltage is not 12V but 5V. The important thing as always is to experiment, experiment, experiment!